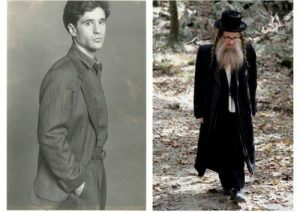 The film explores the two different life concepts of Efroim (Seth) Snyder, a New Yorker visual artist from a secular Jewish background who adopted the Hasidic life style as a young adult. It probes his search for identity and the influence of his religious commitment on his artistic life: What relation is there between the human need for order and rules and the necessity for disorder to avoid unproductive rigor? The rigidly regulated life practice of the Orthodox community shapes a daily life which is structured to radical precision and governed largely by traditional rules and rituals such as clothing, food and prayer. It appears in the contemporary and accelerated, medial organized daily life of the majority of society as antithesis. The film visually charts the evolution of his personal identity, transformation and social reality. By his statement of a cultural difference Efroim is emancipating himself from Western consumer society and materialism culture. His embrace of Orthodoxy can be read as a rejection of the social conventions of mainstream society. The project presents a dialogue between the filmmaker, a Gentile woman and Efroim, an ultra-Orthodox Jewish man, and intimate footage about his early life as a Hasid. The subject is both unusual and provocative. Their encounter requires each to confront the way they live their lives.The challenges they each faced (e.g. the prohibitions on men and women in public and private space) is both a unique part of the project and its thematic core. ← Kreuzberger Salon 63 | N.N.